As a luxurious apartment community in Scottsdale, Miramonte Apartments offers residents beautifully landscaped grounds and remodeled units. However, one aspect of the property was in need of updating: the balcony railings at the apartment complex needed to be replaced. The old railings were made of solid wood, which impaired residents’ views from their balconies and did not match the property’s upscale style. In search of a solution for the outdated railings, the managers of Miramonte Apartment Complex consulted the professionals at DCS Industries. 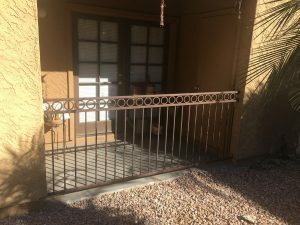 Our team develops customized fencing, gates, railings, and more for a variety of properties throughout the Phoenix area. After examining the grounds and existing balcony railings at Miramonte, we designed, manufactured, and installed 110 wrought iron railings for the apartments. 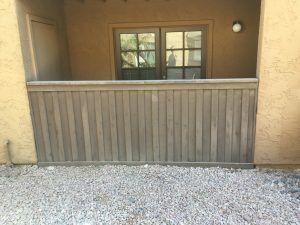 The new railings have a stylish yet simple modern design and are painted in rich earth tones that complement the property’s color scheme. There is space between the pickets, allowing residents to enjoy views of the beautiful surroundings as they relax on their balconies. In addition to its natural elegance, wrought iron is a particularly great choice for outdoor barriers, as it is generally stronger than other materials. As a result, wrought iron is able to withstand rain, strong sun, and other harsh conditions for several years. At DCS Industries, all of our wrought iron products are made of premium-grade steel and the highest quality components—ensuring that the Miramonte property owners will enjoy a minimal maintenance burden, a positive return on investment, and an updated look for their apartment community. Is your property in need of strong and stylish new railings, fencing, or other barriers? The DCS Industries team will work with you to find a wrought iron solution that suits your needs and budget. We have over a decade of experience and are committed to offering premium-quality products at competitive prices. Upon installation, we ensure that the finished product is functioning properly and matches the style of the surrounding property. Call us today at 623-825-7700 to request a free estimate!